Nicolas Raguenet, Le cloître Notre-Dame vu de l’île Saint-Louis, 1753 (détail), Paris, Musée Carnavalet]. 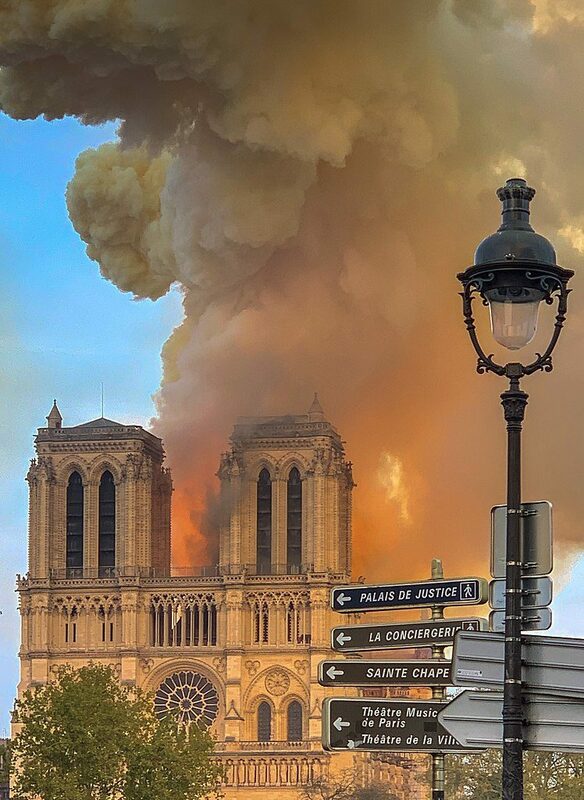 Like most people, I felt a lump rising in my throat when I saw images of Notre-Dame Cathedral lapped with flames and choked by smoke on April 15th. The fire, ostensibly an accidental consequence of renovations gone wrong, felt surreal. But the reality of its destructive potential posed some devastating questions. What would become of its more than 850 years of history? Its delicate, hauntingly beautiful stained glass and rose windows, most painstakingly created during the 12th and 13th centuries and somehow preserved since then? Its mysterious, awe-inspiring Western facade, whose triple decorated portals each tell elaborate biblical stories? One of three decorative portals that grace the Western Facade at Notre Dame. How could we process– much less accept– the wholesale destruction of a cathedral that took hundreds of years to complete, and the thankless toil of thousands of mostly anonymous workers? Would we still remember their unthinkable labor with the clarity we do today? 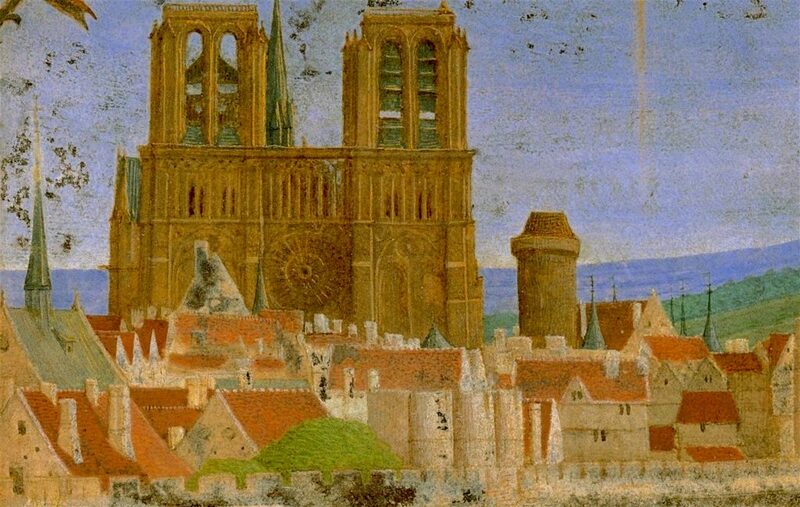 A detail of a 15th-century miniature by Jean Fouquet, showing Notre-Dame and the then-walled Ile de la Cité. After all, we have them to thank for a monument so astounding that it’s nearly impossible to ignore, no matter how many times it creeps into your peripheral vision as you cross a bridge from the Place St-Michel to the Ile de la Cité. This is an oeuvre of human ambition, spirit and aesthetic genius that never seems to lose its epic grandeur, even in the age of the smartphone, which tends to dwarf and obscure the reality of things. And so, seeing Notre-Dame ravaged by fire, mostly on tiny screens and Twitter feeds, seemed like an insulting absurdity. Like so many others, I followed live newsfeeds, anxious to learn what might be preserved and what had already been consumed by fire. Thankfully, not all has been lost. Far from it, in fact. While the famous spire crumbled and much of the wooden roof structure collapsed, the facade, two towers, reliquaries and most of the marvelous stained glass appear to have survived. This was thanks to the heroic efforts of some 500 firefighters working through the night. In addition, many of the cathedral’s finest statues had been preventively removed during the renovation work, so they too remain. Surveying the damage the day after the terrible fire, I was reminded of something. 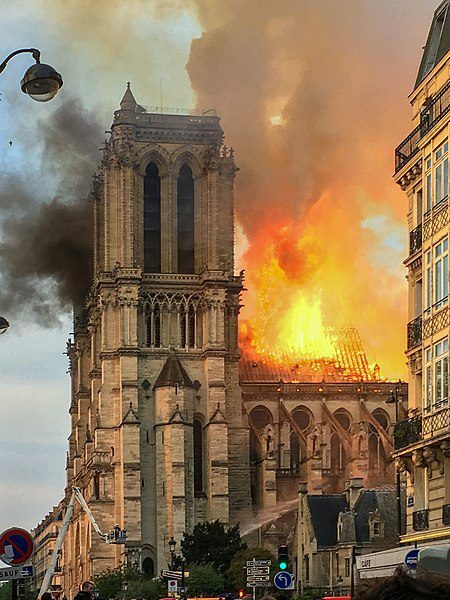 This wasn’t the first time Notre-Dame had been beset by catastrophe. And it probably won’t be its last. 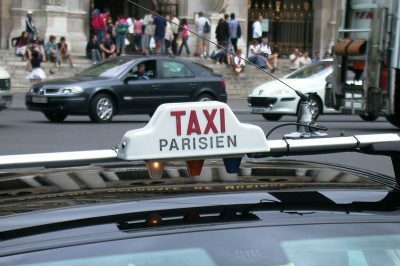 Yet it has endured, somewhat improbably, through hundreds of years of Parisian tumult. As France moved from absolutist royal rule through numerous revolutions, empires and restoration monarchies, the Cathedral stood right in the fray. 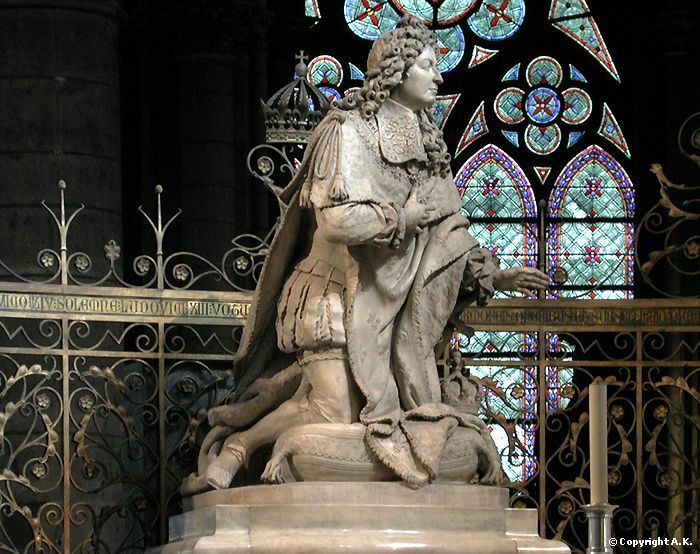 A statue of King Louis XIV in the choir at Notre-Dame de Paris. Image: A.K. 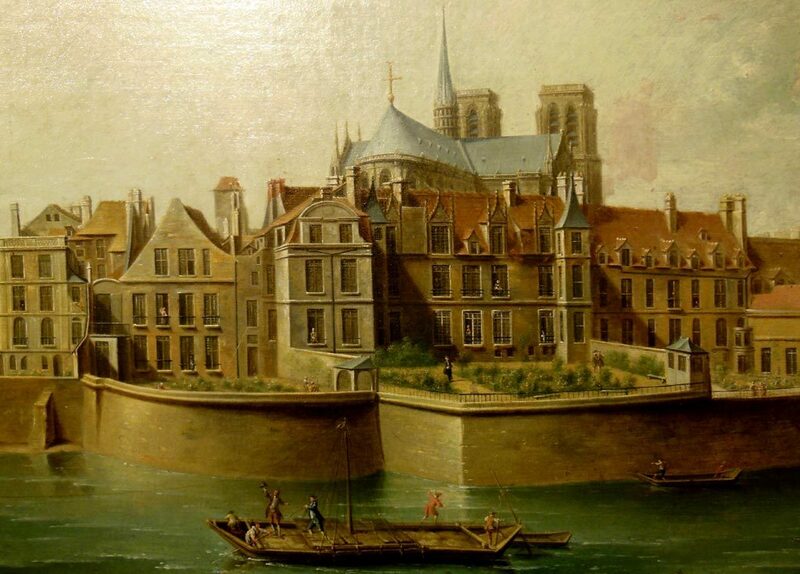 Even prior to the French Revolution of 1789, Notre-Dame was a victim of chaos and questionable royal management. In 1548, during religious conflicts between Protestants and Catholics, rioting Huguenots targeted and destroyed some of the Cathedral’s most precious statuary, considering them idolatrous. French Kings including Louis XIV and XV were hardly reverential toward the Cathedral’s precious medieval art and decorative elements. Finding the stained glass too dark for their early modern tastes, they removed some of the original medieval glass and replaced it with plain panes, allowing in more light. They also removed the original altar and rebuilt one in marble to match contemporary fashions. Needless to say, UNESCO would not have approved. In 1786, just a few years before the Revolution, an immense statue depicting St Christopher and dating to the early 15th century was destroyed. Meanwhile, Notre-Dame’s original 13th-century spire was damaged by strong winds, then removed during the 18th century. 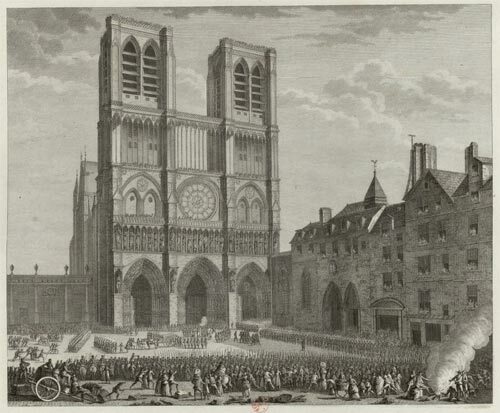 As a potent symbol of both the monarchy and Catholic state power, Notre-Dame was an obvious target during France’s first revolution. Between 1789 to around 1793 or 1794, The Cathedral was repeatedly pillaged and much of the decor and original medieval statuary was destroyed. 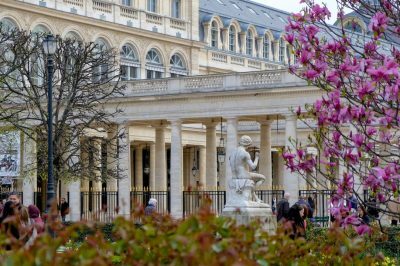 This included the 28 statues of the Kings of Judah (otherwise referred to as the Galerie des rois), and all of the large statues on the facade’s three central portals– with the exception of one depicting the Virgin Mary on the “Cloister Portal”. 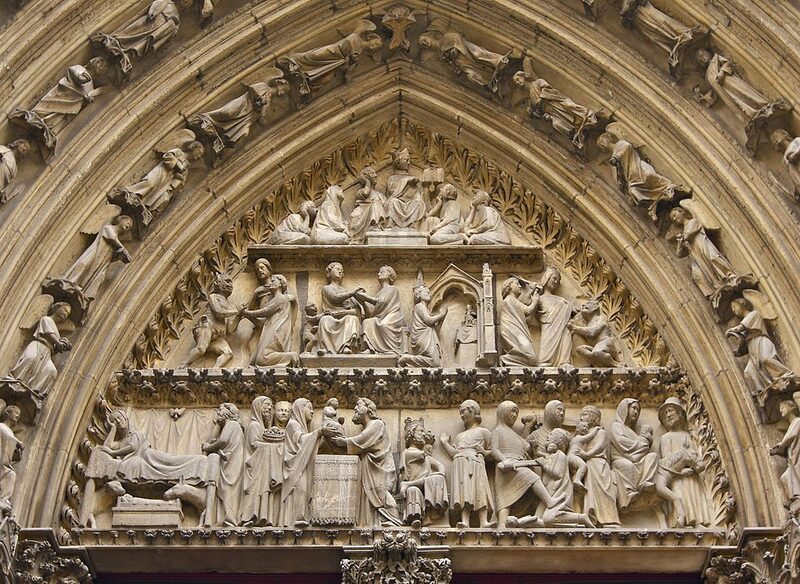 The statues that now grace the portals and upper gallery of the Cathedral’s Western facade are replicas. 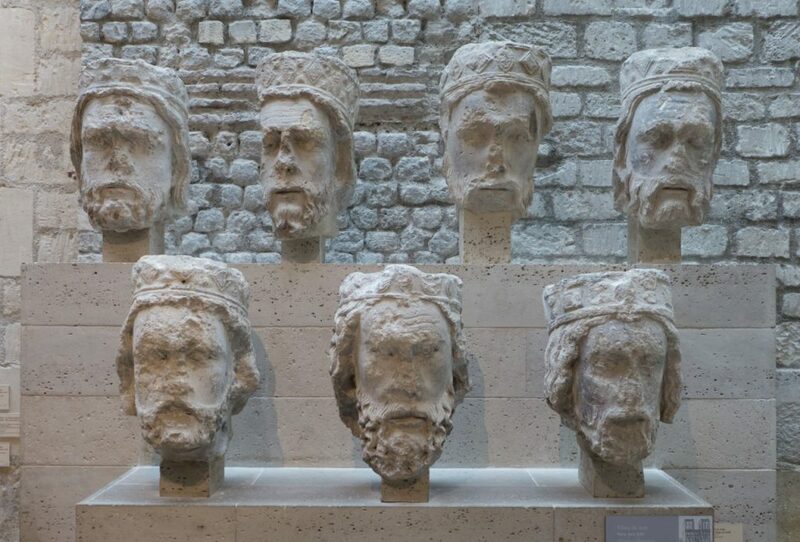 However, most of the decapitated heads of the Kings of Judah statues were recuperated, and 21 of these can be viewed at the Musée Cluny’s excellent collection. Despite these beatings, Notre Dame continued to play an important role in public and political life. 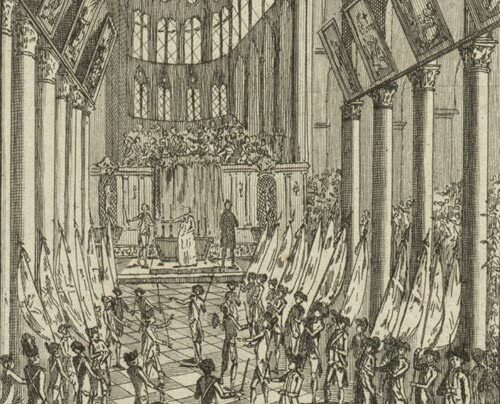 Odd revolutionary celebrations were documented inside during its stint as a “Temple of Reason”, and Napoleon I was coronated there in 1804, underlining its continued symbolic role as a place of power. Still, the Cathedral remained badly damaged in the wake of various Revolutions, and had lost much of its original glory at the turn of the 19th century. 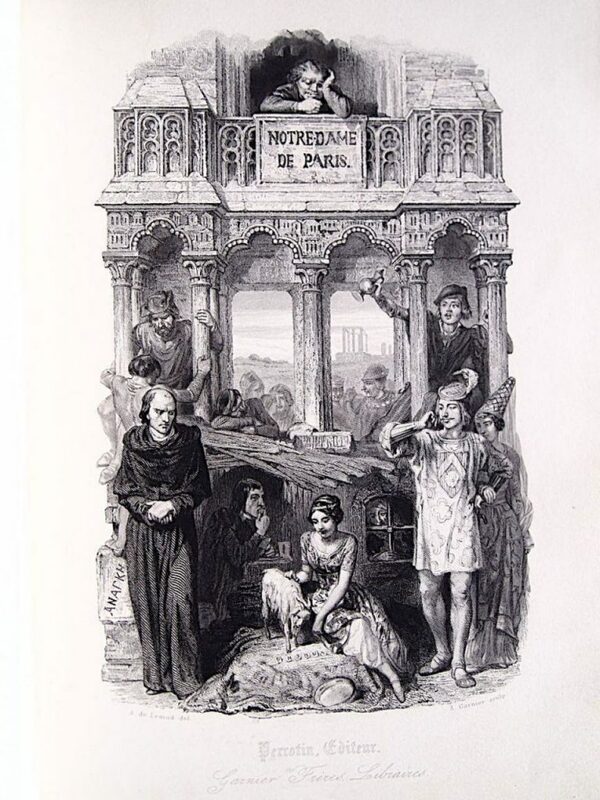 An illustration from an 1844 edition of Hugo’s Notre Dame de Paris (Hunchback of Notre Dame). 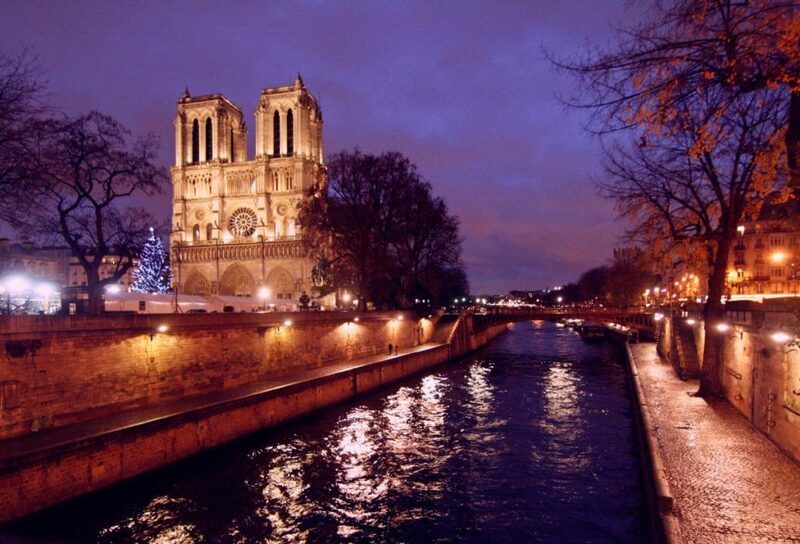 By the time Victor Hugo penned The Hunchback of Notre Dame in 1831, the Cathedral was in a bad state of disrepair. 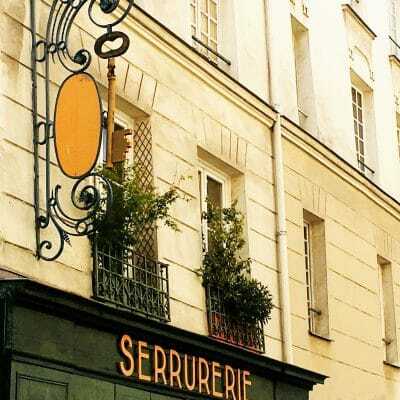 The novel inspired popular new enthusiasm for the sooty, long-neglected monument, and a new ethos of cultural “management” and preservation came to influence the French state. During the 1840s, the architect Viollet-le-Duc began intensive restoration work on Notre-Dame, adding some of the features we tend to think of as timeless– but are in reality relatively young. These include the dramatic Gothic spire which has, sadly, perished in the recent fire. 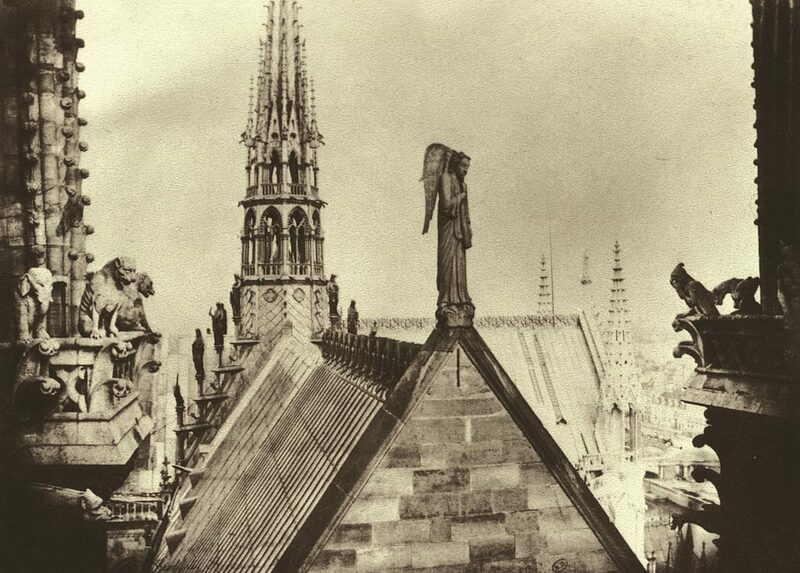 This photo from around 1856 was taken by Charles Marville and shows Viollet-le-Duc’s flamboyant spire and whimsical gargoyles. The architect also worked to restore statuary and details on the facade, some of which had been damaged and pillaged during the Revolution of 1789. And though we associate the Cathedrals’s iconic bells with Victor Hugo and Quasimodo, the current ones fitted at the Cathedral are recent, created in 2013 to replace ones that were judged too worn and lacking in sound quality. 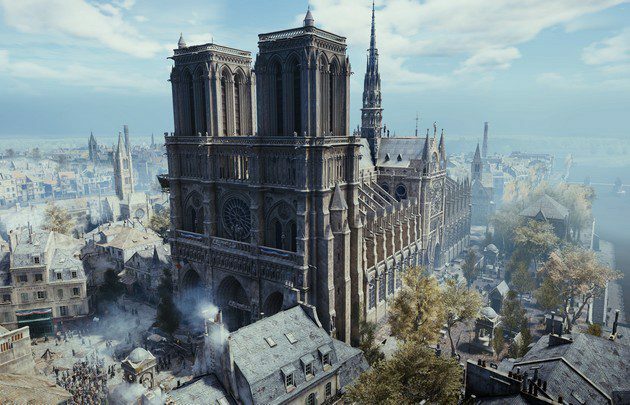 In short, Notre-Dame may have appeared to us as a great, immovable, timeless force on the Parisian skyline– but the Cathedral has always been fragile as all things are, vulnerable to both historical and natural forces. 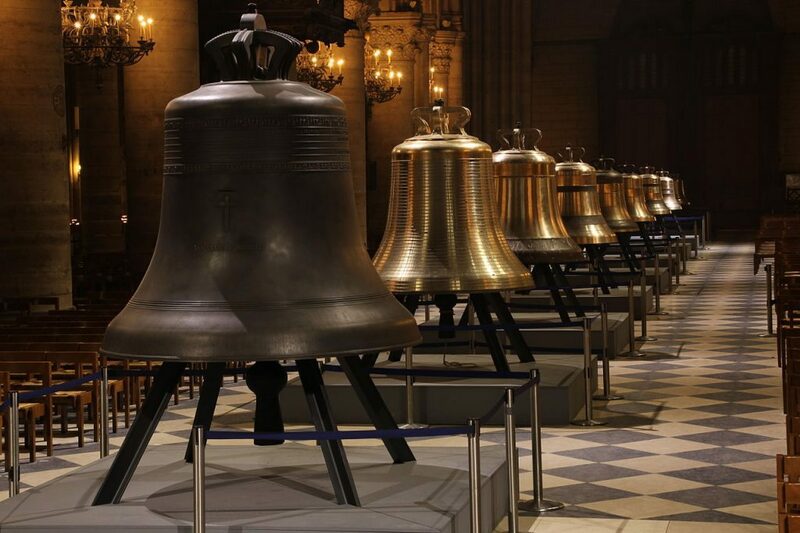 Whatever remains of Notre-Dame (and there’s quite a lot, thankfully), its bells will no doubt continue to sound out in the mornings and evenings, filling the old city with present-day music. It’s been through wars, pillaging, revolutionary zeal and a terrible fire, and has endured nevertheless. 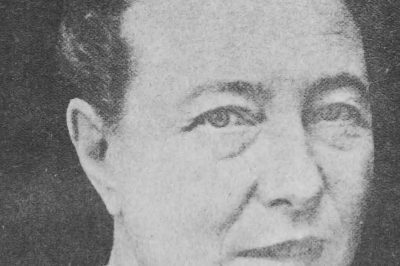 It’s repeatedly risen from all of that to represent something intensely valued by millions of people around the world, whether Catholic, atheist or Buddhist. If we’re to take Cohen’s urgings seriously, let his words serve as a reminder: it’s pointless to dwell on what’s been lost. Moving forward with what we’ve got left is the only thing to do. 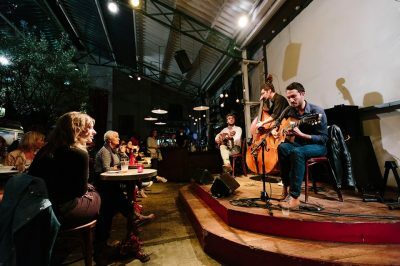 And of course, we should take away the poet’s keen understand that cracks, fires and disasters can be unexpected sources of light and communion. Seeing crowds solemnly gathered around the Cathedral, singing and bearing witness to its ordeal, was a firm reminder of that.